In the latest round of Chancellor’s Awards, two of our students were winners: Aidan Richardson (Part 2, Ancient History) and Stephen Cervini-Attfield (Part 3, Ancient History). The Awards are made on the basis of the previous year’s grades, and recognise exceptional academic performance. 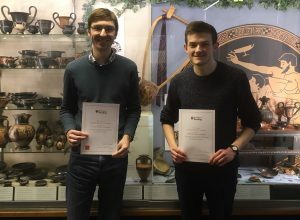 A University-wide awards ceremony was held at the start of term, and yesterday Aidan and Stephen came into the Ure Museum of Greek Archaeology to be photographed with their prize certificates against a suitable Classical backdrop. Congratulations to them both!